Motorcoach; ferry across the Shannon estuary. Free wi-fi available on your motorcoach and in most hotel lobbies. Céad mile fáilte! A hundred-thousand welcomes! Check into your hotel. The rest of the day is free to relax in Ireland’s capital city. This evening, meet your Tour Director and traveling companions for a welcome dinner with wine at your hotel. After a short drive via Clonderlaw Bay to Killimer, cross the Shannon estuary by FERRY. 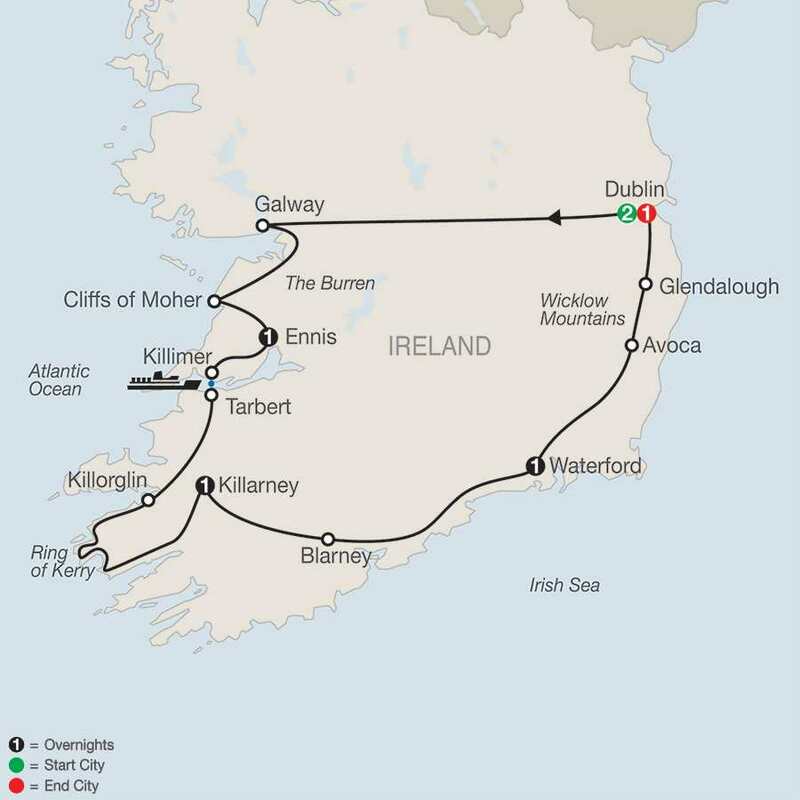 Continue on to Killorglin on Dingle Bay to join the famed RING OF KERRY for a 100-mile panoramic drive around the island’s southwestern tip. Plenty to focus your camera on here: sparkling seascapes, mountains dotted with brightly colored farmhouses, winding lanes bordered with subtropical vegetation, and the breathtaking panorama of the Lakes of Killarney from Ladies View. Travel on to the popular resort of Killarney for an overnight. Across the Kerry Mountains and through County Cork, the route brings you to Blarney, renowned for its magical Kissing Stone. There is time here for lunch, to walk up to the castle, and to shop for traditional Irish handicrafts. In the afternoon, proceed via Cork to Waterford, a stronghold founded by the Danish Vikings, for a guided tour of the HOUSE OF WATERFORD CRYSTAL. The Master Craftsman will demonstrate the traditional methods that are still used to this day and you will learn all about crystal-making, from modern day back to its beginnings in 1783. An exciting agenda today: Enniscorthy, site of the final battle of the Great Rebellion of 1798; Ireland’s oldest HANDWEAVING MILL at Avoca, where you watch the weavers at work; the Wicklow Mountains; and GLENDALOUGH, the early Christian monastic site founded by St. Kevin in the 6th century. See the engaging audiovisual Ireland of the Monasteries, then let your Local Guide show you the remains of this ecclesiastical settlement. Back in Dublin tonight a fitting farewell to Ireland would be an optional evening with dinner, followed by dance, song, and laughter.